The Afterfeast of Theophany lasts eight days following the feast of Theophany on January 6th. It commences on January 14th with the Leavetaking of the feast. On the first day of the Afterfeast of Theophany, the Church extols St John the Baptist as the greatest man born of a woman. He surpasses all the ancient prophets because he baptized the Messiah, Whose coming he foretold. At Vespers we repeat a hymn which has already been sung at Compline for Theophany. In the hymn St John wonders in whose name he should baptize Christ. Should he baptize Him in the name of the Father? The Lord Jesus Christ already bears Him in Himself. Of the Son? He Himself is the incarnate Son of God. Of the Holy Spirit? Christ Himself sends the Spirit. The hymns of this period invite us to purify our minds in order to see Christ. Some of the hymns of this period compare the streams of the Jordan to the life-giving waters of Baptism. Many of the hymns of this period glorify Christ as God Who sanctifies the waters of Jordan by being baptized in them. Divine grace shines forth so that we might be freed from the power of the devil, and cleansed of our sins in Baptism. 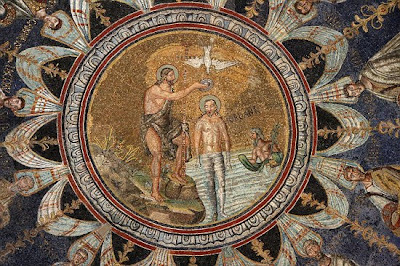 Many of the Church's hymns during this period rejoice in the manifestation of God (Theophany) at Christ's baptism in the Jordan. The voice of the Father is heard, the Son enters the water, and the Holy Spirit appears in the form of a dove. The Leavetaking of the Feast of Theophany takes place on January 14. The entire office of the Feast is repeated except for the Entrance, Festal Readings, Litany, Blessing of Loaves at Vespers, the Polyeleos and the festal Gospel at Matins. The festal Antiphons are not sung at Liturgy, and the Epistle and Gospel of the day are read.